One of the largest statues ever discovered in Indonesia can be found in the foothills of Mt. Welirang, above the small village of Trawas, eight kilometres west of Tretes. Known as Reco Lanang, the statue is just one of a group of gigantic carved boulders, all of which lie within a few hundred metres of one another. Apart from their enormous size, the curious thing about them is that they are all unfinished. When they were commissioned and by whom are questions which have yet to be answered with certainty, but a reasonable guess is that they date from the 13th-14th centuries. 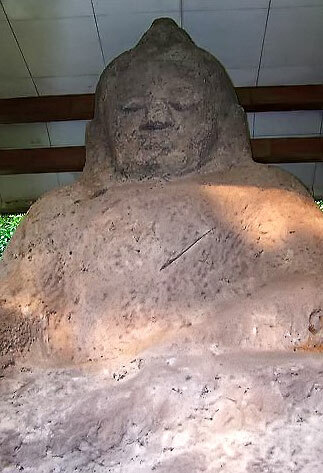 Reco Lanang it self portrays an image of a seated Buddha, almost six metres in height. For centuries the statue has lain, moss-covered, in a clearing on the edge of a pine forest. Last year, however, it was cleaned and restored to its correct, upright position, from where it now looks out across the valley towards the summit of Mt Penanggungan. Today, Reco Lanang has become an object of veneration, recognized by the international Buddhist community. This year, almost two hundred people gathered at the site to celebrate Waisak Day, the anniversary of the Buddha's birth and enlightenment.